Following is the video recording and, further down, the slides and (primitive) audio recording from the invited session “Designing for Mindful Learning with Canvas” offered as part of the Digital Teaching Seminar Series hosted by Asbury Theological Seminary. To cite this presentation, please use the APA citation below or consult your style guide. Thompson, K. (2018, May 24). Designing for mindful learning with canvas. Invited session within Asbury Seminary’s Digital Teaching Seminar Series, Asbury Theological Seminary, Wilmore, KY. Retrieved from http://ofcoursesonline.com/?p=508. Single Slide 03: What About Blended Learning? For this third “single slide” session, I shared thoughts on the affordances of blended learning with an eye toward new implementations and innovations of blended learning at UCF. [Episode 3]. 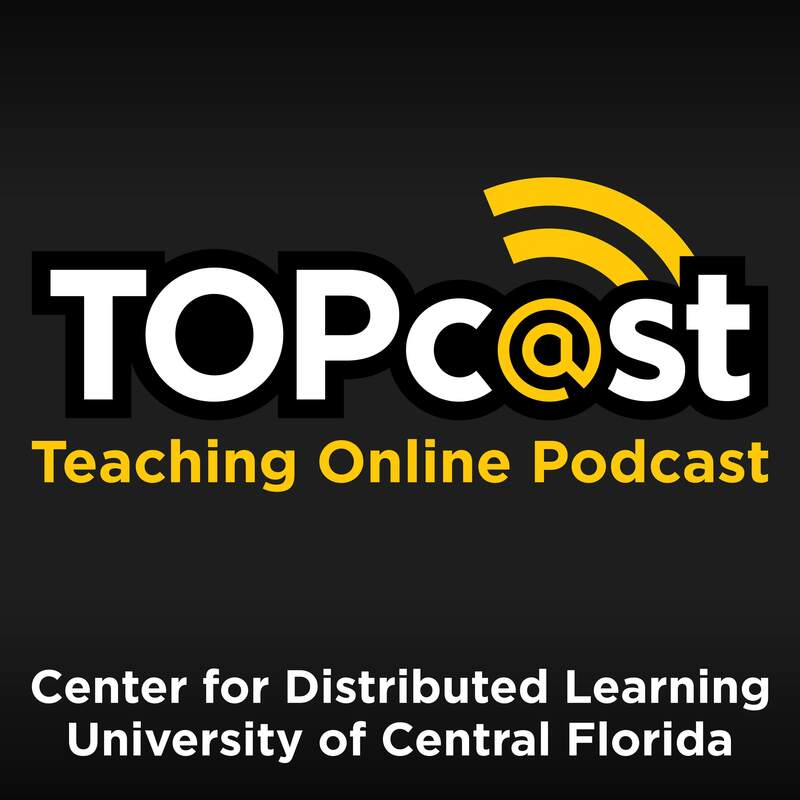 TOPcast: The Teaching Online Podcast. Retrieved from http://cdl.ucf.edu/topcast-s01e03. Following is a description of and (primitive) audio recording from the closing keynote address “Two Stories and a Conversation (aka Apples & Grasshoppers)” at the 2018 Teaching Online Preparation Toolkit (TOPkit) Workshop. Thompson, K. (2018, March 15). Two stories and a conversation (aka apples & grasshoppers). Keynote address at TOPkit Workshop 2018, University of Central Florida, Orlando, FL. Retrieved from http://ofcoursesonline.com/?p=499. For this second “single slide” session, I shared Dr. Joel Hartman’s construct of “models of practice” and his 2002 articulation of the six models of practice underlying online education at UCF at that time with an eye toward considering which models need re-articulation, modification, or forking. Hartman, J. L. (2002). Models of practice in distributed learning: A catalyst for institutional transformation (Order No. 3069446). Available from Dissertations & Theses @ University of Central Florida-FCLA; ProQuest Dissertations & Theses A&I; ProQuest Dissertations & Theses Global. (305439802). Retrieved from https://login.ezproxy.net.ucf.edu/login?url=https://search.proquest.com/docview/305439802?accountid=10003. I’m meeting monthly with our instructional design team to have constructive dialogue around concepts involved in our work. I’m doing this by sharing a single slide, elaborating on it verbally, and then inviting conversation. Ideally, all within 10 minutes! I’m recording the presentation portion of these sessions and archiving here the audio and the slide from each. In NMC’s “Innovation Implementation Learning Curves” webinar, Gates Bryant (Tyton Partners) and Kelvin Thompson (UCF) discuss how to best support higher education faculty in adapting their pedagogies and adopting scalable digital learning tools. Following is the webinar recording. Bryant, G. and Thompson, K. (2017, October 18). Innovation implementation learning curves. Invited session within the New Media Consortium’s Beyond the Horizon webinar series, Washington, DC. Thompson, K. (2017, February 7). Building student engagement in online courses. Invited session within the Council of Independent Colleges’ Consortium for Online Humanities Instruction webinar series, Washington, DC. Retrieved [date here] from http://ofcoursesonline.com/?p=448. Following are the slides and (primitive) audio recording from the keynote address “Eggs, Ecosystems, and the Power of Connected Learning” at the 2015 Florida District Virtual Instruction Program Network Symposium (FLDVIPN2015). Click along with the slides on SlideShare while listening to the session audio. Thompson, K. (2015, February 18). Eggs, ecosystems, and the power of connected learning. Keynote address at Florida District Virtual Instruction Program Network Symposium, Altamonte Springs, FL. Retrieved [date here] from http://ofcoursesonline.com/?p=421. Following are the slides and (primitive) audio recording from the presentation co-presented with Rudy McDaniel and Joey Fanfarelli: “Stinkin’ Badges: Why We Need ‘Em and How to Use ‘Em” at the 2014 Information Fluency Conference. In this segment, I reflect upon some recent experiences with communicating at a distance and extrapolate some principles for online and blended practitioners.